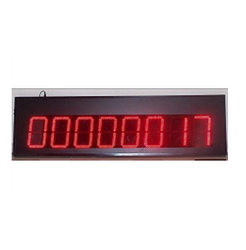 People Counting Displays is essential for shopping mall management / property owners / amusement parks etc. to have information about the number of visitors entering the premises. This helps to measure the performance as well as to plan operations depending on the traffic. This information can be used in various ways related to planning, running and optimizing the organization of the facility provision. The people counter counts the number of people entering the premises taking input from either turnstiles or locating sensors at strategic positions to sense the movements of the people entering. The counting is usually up /down type to give indication of number of people in the premises at any given point of time. Options available are remote display to show the count visible from a distance. PC connectivity to connect to management software and offer data online for necessary processing. Looking for People Counting Displays For Malls ?